One of my favourite places in my entire month in Bali was not even on Bali. 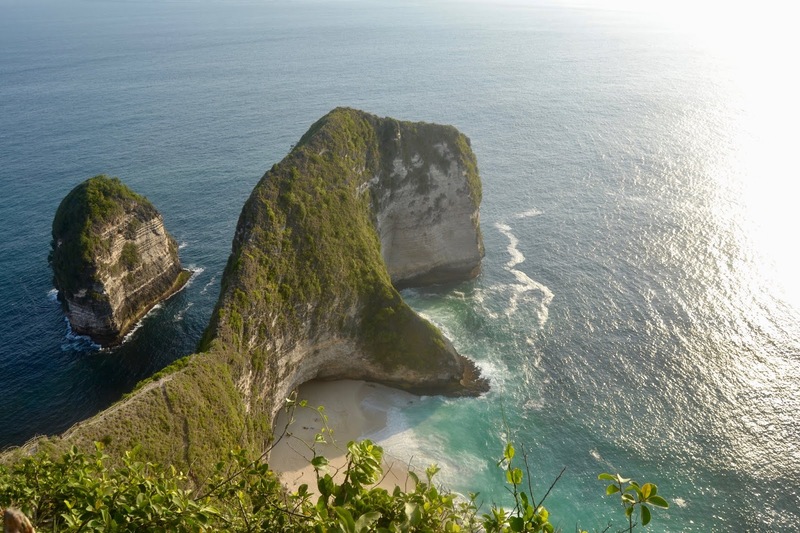 It was the little archipelago of Nusa Penida, Nusa Lembongan and Nusa Ceningan. 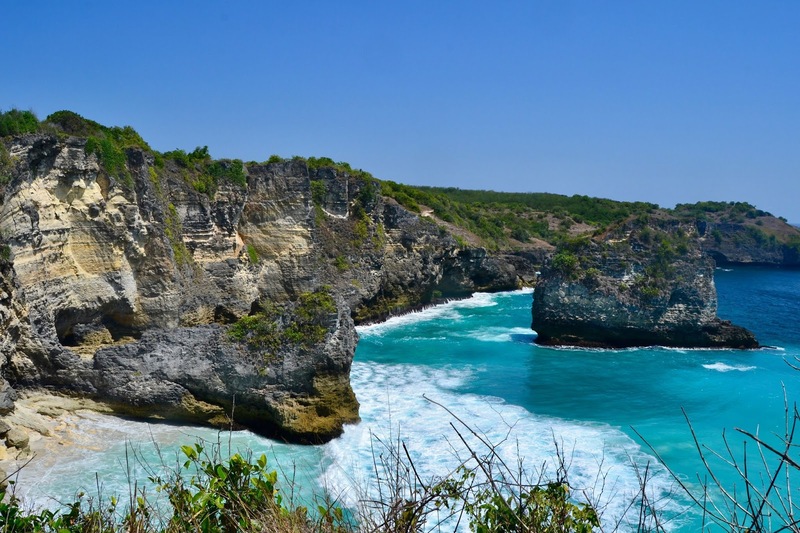 While Nusa Lembongan and the neighbouring Ceningan have been long-time favourites of surfers, Penida has only recently become a tourist hotspots. The beaches here are shockingly beautiful, the water is a deep turquoise and they are loads of things to do. 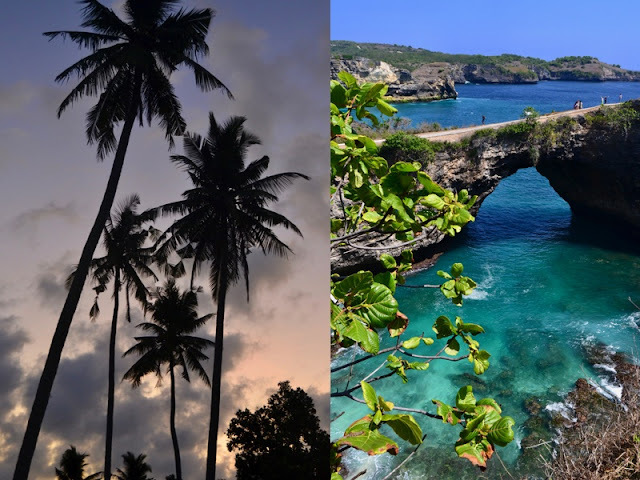 I fully enjoyed all aspects of the islands with Penida being a little more rough and adventurous while Lembongan and Ceningan are more comfortable and beachy. We slept in a four bed room at Nusa Garden Bungalow, which the three of us had all to ourselves. While the accomodation is relatively basic (e.g. no aircondition) I absolutely loved the layout with the little bungalows, the beautiful garden and was fully happy with the cleanliness of the place. It is also located conveniently in walking distance to different cafés and has a little restaurant itself with extremely cheap breakfast. For this booking or any other booking on booking.com you can get 15€ off by using my referral link. I also prefer booking to Hostelworld, because they do not take any commission, which may only be 1 or 2 Euros each booking, but can quickly add up on month long travels. The first thing that comes to mind (at least for me) about Nusa Penisa is the famous Kelingking beach, that probably has been featured in a million Instagram posts by now. And while we did go and it is very beautiful, it is also aggressively overrun and the island has so much more to offer! The cheapest way to get around is definitely getting a scooter for about 60 000 Rupia a day. And while we did that and I had a lot of fun, I am also very surprised that we managed to get around without an accident. The roads are absolutely terrible and you should never rely on Google maps is all I can say. However if you like a little adventure and are confident on a scooter (and have good travel insurance) it is a great experience. We spent two days roaming the island and I really think you need at least that if you use a motor bike. Our first stop was Peguyangan Waterfall, which is not only a waterfall cascading into the sea, but also a beautiful temple right by the ocean. Just be prepared: to get to the temple and the beautiful natural pools you have to climb down some very very steep and slightly slippery stairs. Being terrified of heights this was truly a challenge for me, but the beautiful views and dip in the pools at the end of it all made it worth it. The temple provides you with sarongs and as hot as you get going down, and especially up again please be respectful in the temple area. From the temple we headed towards Kelingking beach for sunset and made it just in time. The beach is supposed to be gorgeous, but the climb down there looked even less safe than the one at the temple and I had used as much of my courage as I can muster for a day, but it seems like a great place for a beach day. For sunset I highly recommend snapping your picture and then making your way back to the carpark, continue to the left for about 5 minutes, where you reach another absolutely stunning viewpoint you have all to yourself. On our second day we headed to Manta Bay. There are loads of snorkeling and also diving tours on Nusa Penida and Manta Bay is apparently one of the favourite spots, because you get to see - you guessed it - Mantas. We thought we´d be smart and just go by ourselves, but jokes on us: you can only reach Manta Bay by boat. It is still a stunning view, but I fully recommend doing one of the snorkeling tours. From Manta Bay we made our way to Broken Beach and I know I might bore you but the "roads" were wild. We got lost multiple times this day and I way pretty sure we were never going to make it, with Google Maps navigating us through absolute rubble, little villages and forests. I am glad the guys I was with were more secure on their scooters than I was and that no one got hurt. Broken beach however is really worth it, especially because you get to dip into Angels Billabong, a completely natural infinity pool. Our last stop was Crystal beach for sunset, which also was stunning and I think would be perfect for a day of snorkeling and beaching. There is probably no way to count the number of speed boats between Nusa Penida and Nusa Lembongan. With only 50 000 Rupia one way and about 20 minutes to cross you really do not need to book ahead at all. You start at Toya Pakeh Harbour and get dropped off at the yellow bridge, that connects Lembongan and Ceningan. The taxis from here will take 100 000 Rupia no matter how far you go and while you could walk a lot of the distances, it depends on how heavy your backpack is if that is worth it to you (ahem chronic overpacker here). We also rented scooters on Lembongan and you can easily drive around the entire island in about 45 minutes and on much better roads than on Nusa Penida. We got a really good deal on booking for the Pange Hostel, which was an absolute oasis with beautiful, clean new rooms, a private bath room, air condition and even free breakfast of toast and fruit. It was one of my favourite hostels and I would highly recommend staying here. Since both Lembongan and Ceningan are fairly small and connected conveniently through the yellow bridge you can easily see both islands in two or three days. On Lembongan we spend our first day lounging at Le Nusa Beach Club. This beach club is right by Mushroom beach, which sadly is full of boats, so the beach club is a great alternative. And while the day beds are 100 000 Rupia per day, if you have lunch there, they let you use the beach chairs for free. On the next day we headed over to Ceningan. Right after the yellow bridge on the road to the Blue Lagoon there is an array of beachside restaurants, who all have a great ocean view and little swings out in the sea, who scream for an Instagram shot. I honestly think most of them are great and can´t even say which one we opted for, however one of them has a pool so maybe that is the one you should choose. After lunch we headed to the Blue Lagoon, which is truly stunning, but once again not suited for swimming. We then headed back to Lembongan and checked out Devils Tear, a blowhole. Learn from our mistakes and check tide times before you go. While it was still really cool to see the sea coming in and out, I am sure it is a little more impressive at high tide. To finish our day off we had sunset drinks at Dream Beach Huts, which has a beautiful roof top bar with beautiful views and a great 2 for 1 happy hour. We then had dinner at Water Blow Huts on the other end of Dream Beach, a beautiful resort with really really great food and tables right at the cliff to the beach. 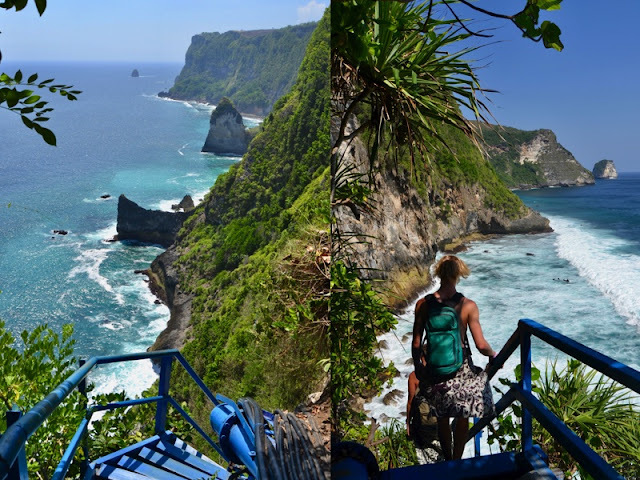 If you are in Bali please please do not miss out on the Nusa islands, I think they may have been my highlight of the trip and I would happily come back here for an entire week of relaxing and exploring.